I exactly use the code you described in this post an in your book. I now have the problem that my IDP (openAM) can't verify the signature of my request. 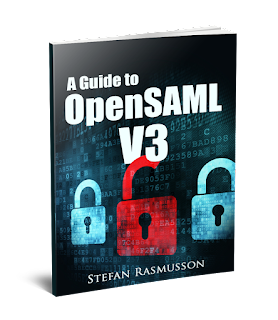 The problem is that the encoder does not include the signing section in the SAML request so openAM cant verify. When i debug the code i can see the the security context is available with all needed data from the keystore but after encoding there is no signature section in the request. Do you have any idea what could prevent the Encoder to add the signature section to the SAML request? When you get redirected to OpenAM there should be a request marked green with your SAML request. Please paste the information under the SAML tab. I cant post the SAML Request here, but there is no signature in the SAML Request. I think openAM expects the signature directly in the SAML request or do i need to change something in the openAM configuration? The standard states that, when using the Redirect binding, the signature should not be sent in the SAML XML but in a separate URL parameter. ERROR: UtilProxySAMLAuthenticator.authenticate: authn request destination verification failed. I am not sure why this error happens. I think i used the correct keys and have the correct Public Key in my Service Provider. I also checked the Algo and think its correct. Do you have an idea why openAM throws this error? I think that the destination field in your AuthnRequest and the one for OpenAM does not match. Your destination is "http://openamstage.managed-connectivity.de/login/SSORedirect/metaAlias/idp". Make sure this is the same as the in the OpenAM metadata. In openAM the destination was defined with the http Port in The URL (http://openamstage.managed-connectivity.de:80/login/SSORedirect/metaAlias/idp). I changed it in des Request and now it works perfectly! I have to manually sign the object. Could you explain how we could verify the signature of a redirected AuthnRequest. I couldn't find an example of this in the book.